Corporate donors to a green energy nonprofit operated by Senate Minority Leader Harry Reid’s (D., Nev.) former staffers and a current campaign operative have received billions of dollars in federal loan guarantees and grant money as a result of Reid’s advocacy. Fulcrum Bioenergy began contributing to the Clean Energy Project (CEP) in 2013. One year later, the Nevada Democrat steered tens of millions of dollars in federal grant money to the California biofuel company. Fulcrum is one of at least nine corporate donors to the Clean Energy Project (CEP) that have secured federal financing for themselves or a client due in part to Reid’s behind-the-scenes advocacy—activity that watchdogs warn could be construed as unethical. Rebecca Lambe, Reid’s top political strategist who has been directed by Reid to take the lead in hiring for his 2016 reelection campaign, founded CEP in 2008 and served as its executive director. Reid’s former chief of staff Susan McCue served as CEP’s president at that time. Lambe is now an adviser to CEP, according to her official bio. McCue is a member of its board. McCue and Lambe also run Senate Majority PAC, a powerhouse Super Pac with close ties to Reid that spent $67 million to elect Senate Democrats last year. Far from denying a role in steering subsidies to donors to aides’ group, Reid’s office brags about it. "Senator Reid’s leadership on creating clean energy jobs in Nevada is something we like to talk about at every opportunity and we are glad you have chosen to cover this topic," Reid spokesman Adam Jentleson said in an emailed statement. Jentleson pointed to his office’s 2013 staff report on the benefits that green energy companies such as Ormat Geothermal, which Reid helped secure a $350 million loan guarantee, were bringing to Nevada. A news release on the staff report quoted Lydia Ball, until February CEP’s executive director, about the benefits of an "aggressive clean energy path for Nevada." It didn’t mention that Ball is a former Reid aide, that Ormat has donated to her organization, or that the company’s president has donated to Reid. While on Reid’s staff, Ball was in charge of advising Nevada companies on how to obtain financing through the American Recovery and Reinvestment Act, better known as the stimulus. She also helped organize the National Clean Energy Summit, an annual conference cosponsored by Reid and CEP where environmentalists, politicians, and green energy executives discuss the need for more government "investment" in green companies. Fulcrum contributed to CEP in 2013 and 2014. It attended the 2014 summit, where Agriculture Secretary Tom Vilsack announced a $105 million grant for the company. The Defense Department awarded it another $70 million two weeks later. The Center for American Progress has sponsored the summit since it was created in 2008. John Podesta, CAP’s founder and former chairman was a CEP board member until at least September 2013. He is expected to work for the 2016 presidential campaign of Hillary Clinton, who was the 2014 summit’s keynote speaker. The Podesta Group, the lobbying firm founded by Podesta and his brother Tony, began representing Fulcrum in April 2014, five months before that year’s CEP summit—and the $175 million in federal grants that followed. The firm reported lobbying the Executive Office of the President during the third quarter of 2014, when Fulcrum received the grants. That remains the only reporting period in which it has done so. Reid took credit for delivering the Pentagon’s money. 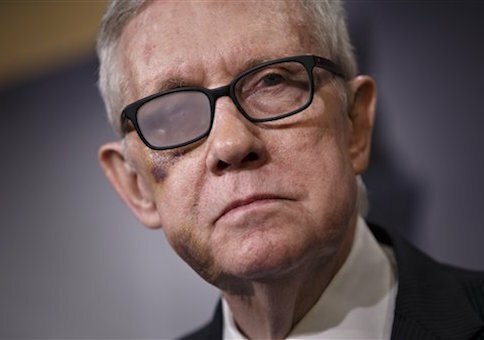 "Senator Reid wrote Secretary [Chuck] Hagel in support of Fulcrum’s grant application earlier this year," his office said. Most of CEP’s corporate supporters are companies that have benefitted or stand to benefit from policies that subsidize green energy technologies—policies that Reid routinely pushes for in the Senate. Their donations to the CEP suggest "a vehicle to promote pay-to-play politics," says Ken Boehm, chairman of the National Legal and Policy Center, an ethics watchdog group. "It is run by Reid insiders, funded by those who want Reid's political favors, and there's a track record of Reid dispensing favors to those who fund it," Boehm said in an email. "As the late Senator [Sam] Ervin said, sometimes things are what they look like." Asked whether donations to CEP bought or rewarded Reid’s legislative support, Jentleson noted the 5,500 Nevada jobs—temporary, permanent, and "indirect"—created by Reid-supported CEP donors. "With specific regard to the projects you mention, Senator Reid is extremely proud of his involvement in each one of them," Jentleson said. McCue denied that political considerations played any part in donations to CEP or Reid's efforts to steer subsidies to those donors. The group "does not do any federal lobbying on behalf of its supporters," she said in an emailed statement. "Sen. Reid has long worked to make Nevada the clean energy capital for the country, successfully bringing new companies and thousands of good new jobs to the state," McCue said. "He would, and will, do that whether they supported CEP or not." Good government advocates say donations to independent groups with ties to prominent politicians can raise red flags. "Gifts from moneyed interests to politicians’ pet charities always merit added scrutiny and concern," said Sheila Krumholz, executive director of the Center for Responsive Politics. "There are innumerable ways that money can be used to help shape policy and one of those is supporting a nonprofit connected to the politician or political operative," Krumholz said in an interview for a separate story. CEP did not respond to a request for comment by press time. The group’s website listed Ormat Geothermal as a donor in 2012, a year after Reid helped it obtain a $350 million loan guarantee. He also helped secure nearly $100 million in federal financing for Nevada Geothermal, which counted Ormat as a contractor. Reid pressured the Department of the Interior (DOI) to expedite permit approvals for Nevada green energy projects, according to the New York Times. Seven companies eventually received fast-track treatment from DOI, including Ormat, Nevada Geothermal, and CEP donors Abengoa, First Solar, and SolarReserve. Also at bat for Ormat was Cassidy and Associates, a lobbying firm and CEP donor that boasts Lambe as a senior adviser. Cassidy lobbyist Kai Anderson, Reid’s former deputy chief of staff, continues to represent the company. During fiscal year 2009, Ormat had three loan-guarantee applications rejected for being "non-competitive." Cassidy inked its contract with Ormat in April 2009. Five months later, Reid sent a letter to President Obama expressing concern about the slow pace of DOE loan guarantee approvals, though he did not ask for specific projects to be approved. Ormat received its $350 million loan guarantee in 2011. Reid thanked Obama and then-Energy Secretary Steven Chu in a statement for "for their commitment to putting Nevadans back to work and boosting Nevada’s clean energy economy." Another former Reid aide was working behind the scenes to secure that financing. Paul Thomsen, then Ormat’s in-house lobbyist, handled "emerging energy resources, and public land issues" on the senator’s staff. He also starred in a 2010 campaign ad for the senator. Thomsen is a former lobbyist for Lionel Sawyer & Collins. All four of Reid’s sons have also worked for the firm, as has CEP board member and former Reid staffer Brent Heberlee, who says he "maintains a strong working relationship with the Senate Minority Leader." Ormat’s ties to Reid caught the attention of the House Oversight and Government Reform Committee, which began investigating the Obama administration’s support for green energy projects in 2011. "The strong ties between the company and the Senate Majority leader raise questions about whether the DOE acted in the best interests of the American people when it approved [Ormat’s] loan guarantee," the committee wrote in a 2012 report. Internal DOE emails reveal that Reid pressured the department to speed approval of stimulus-funded loan guarantees. One email from Jonathan Silver, who directed DOE’s loan programs office, suggested that Reid was determined to secure pork for Nevada businesses through DOE’s stimulus-funded loan guarantees. CEP donor SolarReserve was among the companies that took advantage of Reid’s aid in securing financing. He pushed DOE in 2010 to speed approval of a $737 million loan guarantee for the company’s Nevada manufacturing facility. CEP donor NV Energy, the state’s largest utility, got a $138 million stimulus grant after, Reid said, "I advocated for this funding." He also touted his work in extending solar power tax credits in announcing that SolarCity, another CEP donor, would build a new manufacturing facility in Nevada. Some of CEP’s donors are members of the Solar Energy Industries Association, the industry’s trade association. SEIA itself is a CEP donor, and represents a host of other companies that have benefitted from federal green energy policies, including several that Reid has backed. CEP board member Rose McKinney-James represents Amonix, a solar company that received federal backing after Reid went to bat on its behalf. "I made sure the Recovery Act included almost $6 million in tax credits to help Amonix open this facility," Reid said in 2010 of the company’s Las Vegas production plant. Reid has also aided McKinney James client Bombard Renewable Energy. Her clients also include the Valley Electric Association, a CEP donor. She sits on the board of MGM Resorts International, according to the company's website. That company sponsored last year's summit. Anti-cronyism watchdogs were skeptical of the benefits of Reid’s dealings. "Of course these businesses viewed their donations as investments," said William Yeatman, a senior fellow and energy policy expert at the Competitive Enterprise Institute. "The entire green energy industry—every bit of it—is dependent on political favoritism," Yeatman said in an email. "And with whom better to curry favor than the Senate Majority Leader—especially during the stimulus era, a period during which oversight was shortchanged for speed of disbursement." This entry was posted in Issues and tagged Cronyism, Green Energy, Harry Reid. Bookmark the permalink.